Developing a truly percutaneous, safer and more cost-effective procedure for people living with persistent, discogenic low back pain. More than 500 million people report having back pain yet there remain few treatment options. OrthoSon: developing a safer, cost-effective treatment to restore spine function and alleviate symptoms, for patients living with persistent, discogenic low back pain. Sonosensitive particles are injected into a degenerated intervertebral disc and activated with external ultrasound to perform a controlled nucleotomy, all with full real-time ultrasound imaging. Hydrogel is then injected, forming in-situ to create a prosthetic nucleus pulposus with a physiological form factor for sustainable restoration. The entire procedure is designed around a single 0.5mm puncture in the annulus fibrosus and to be performed on a day-case basis. Our patented Passive Acoustic MappingTM procedure will image the nucleotomy in real time for safety and control. 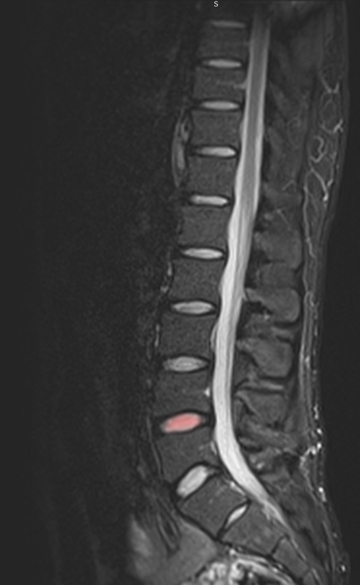 Low back pain is often caused by the degeneration of one or more intervertebral discs. Despite the large number of patients and the significant impact on quality of life, when conservative therapy is unsuccessful, other options can be limited. We aim to help people who need treatment without the need for major surgery. Invasive, high-cost procedures associated with significant complications. Poor correlation with diagnosis. Imagine removing then replacing a degenerated nucleus pulposus with just a 0.5mm puncture in the annulus. Patented, tiny polymer particles around 450nm across, trap a bubble of air. This bubble, when subjected to the right ultrasound wave, expands and collapses explosively (called cavitation). In sufficient number this cavitation can cause the controlled, targeted fractionation of tissue such as the nucleus pulposus. The first step in the process is to inject billions of these tiny particles into centre of the degenerated nucleus pulposus. Next a dual therapeutic and diagnostic, stereo ultrasound array is positioned on the patient's back. As the highly focussed field is applied the particles cavitate, fractionating the degenerated nucleus. Our patented Passive Acoustic MappingTM uses the integrated diagnostic array to produce real-time imaging of the cavitation for full surgeon control. The nucleus replacement is injected into this cavity in liquid form, using the same needle, before curing. The prosthetic is then well integrated into the annulus and has a physiological form factor for sustainable performance. Immediate restoration of function and physiological form factor designed for sustainable alleviation of symptoms. Percutaneous nucleotomy using OrthoSon’s patented, ultrasound activated Sonosensitive particles. Real time imaging with patent protected Passive Acoustic MappingTM technology for safety and control. The procedure is designed to be performed by a range of professionals including spine surgeons, anaesthetists, radiologists and pain specialists. While other treatment options seek to address the pain, Orthoson is developing its technology to address the underlying cause of back pain with a truly minimally invasive procedure. Our technology is intended to deliver a prosthetic nucleus pulposus, with a physiological form factor, through a tiny needle that minimises disruption to the annulus fibrosus. We believe this will allow the sustainable restoration of spine performance and alleviation of symptoms that patients need, without the risks and complications of major surgery. Whether you live with low back pain, are a clinician or an investor and would like to know more, please get in touch. We would love to hear from you. We’re always interested to speak to potential collaborators or investors. If you'd like to be involved or just to find out more, please get in touch. Using the form or by calling or sending an email. 1. The Global Spine Care Initiative; Eur Spine J. 2018 Sep;27(Suppl 6):796-801. doi: 10.1007/s00586-017-5432-9. Epub 2018 Feb 26.